NYMPH is a Brooklyn-based psychedelic-shred/avant-garde outfit whose tempestuously transcendent music has penetrated the New York music scene with bared teeth for several years now. Their compositional palette encompasses an ebullient kaleidoscope of sound: imagine 13th Floor Elevators essaying a Rahsaan Roland Kirk jam and you begin to get the picture. Or maybe Steve Reich bonging out on Pandit Pran Nath and jamming with This Heat. The four-piece’s orgiastic din is composed and orchestrated by the nucleus of Matty McDermott (formerly of Coyote – Birdman Records) and Eri Shoji; and currently featuring the thundering harmonic prowess of bassist Nickle Emmet, with Jason Robira (Dark Meat) pounding the skins. Matty comes most avowedly from a rock n roll, free jazz and noise background. He conjures the spirits of chaos and harmony he earned in those Osirian trenches thus bestowing his prowess in to the nimbus of Nymph. Matty’s inner animal comes mostly to bear in his monstrous guitar sound: echoed, reverbed, distorted, slack-jawed, claw-toothed & sharp as lethal icicles, it is equal parts Greg Ginn and Erkin Koray. However, it is his vastly sprawling nomadic tonal vision that catapults Nymph asunder the regressive hordes of jackbooted hipsters in kaftans. The blissful spirit and luxuriant execution of Matty's showering riffage has much more in common with the excursions of later-era John Coltrane and Can than it does with an orthodox devotion to the stereotypical three chords that has come to be recognized of late as "Psychedelia." Eri, like the caterwauls of a Japanese banshee, expells the piercing vocal counterpoint to Matty's mesmeric guitar. Eri relies on intuitive vocal exression largely free from the semantic bounds of lyric; her mode finds form in a cavalcade of orgasmic yelps, howls & piercing screams. Eri's expressive tact invariably culls a likeness to Yoko Ono and , while this is valid and complimentary, the coparison is somewhat superficial; Eri has studied Hindustani classical singing, as well as spent time with the teachings of La Monte Young and Marion Zazeela, both disciples of Pandit Pran Nath, while bringing a lived-in knowledge of improvisational Gagaku and Butoh traditions of he native shores. With a handmade array of percussion instruments reminiscent of the Sun Ra "lightening drum" (including ankle bells, tambourines, ghavals and vests made of prayer bells) Eri cuts an exrtemely magnetic and ethereal presence on stage. Her iconoclastic style and impassioned percussion-via-dancing provides the visual linchpin and hyper-sexual tension that propels the band through their hypnotic live show. 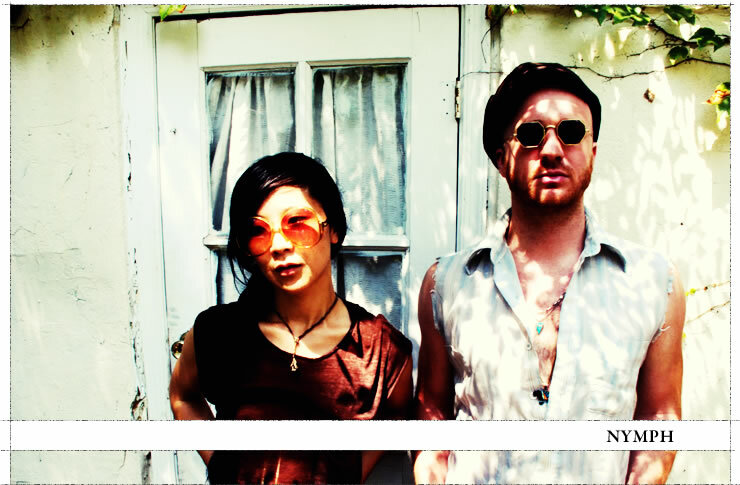 NYMPH has played extensively in New York City and throughout the east coast, recently completed a full US tour, and shared stages with the likes of Deerhoof, Psychic Ills, Dark Meat, Indian Jewelry, Tussle, Excepter, Extra Golden, Kayo Dot, Man Man, Icy Demons, Bear in Heaven and many more.